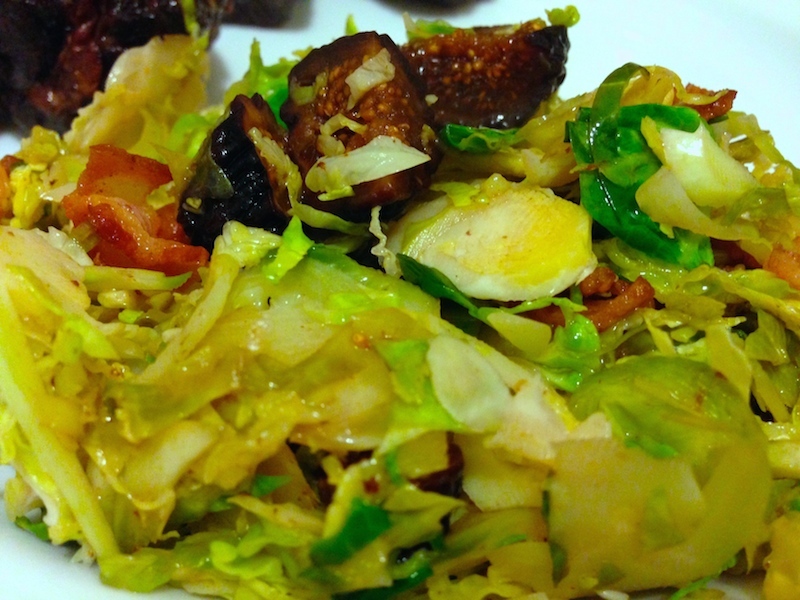 A few weeks ago I posted a recipe for bacon and fig Brussels sprouts slaw. Shredding Brussels sprouts was revolutionary for me. Just a few weeks after having the Brussels and bacon slaw at my in-laws’ Thanksgiving feast, I had a similar dish but cold at one of our favorite neighborhood restaurants, Petit Oven. 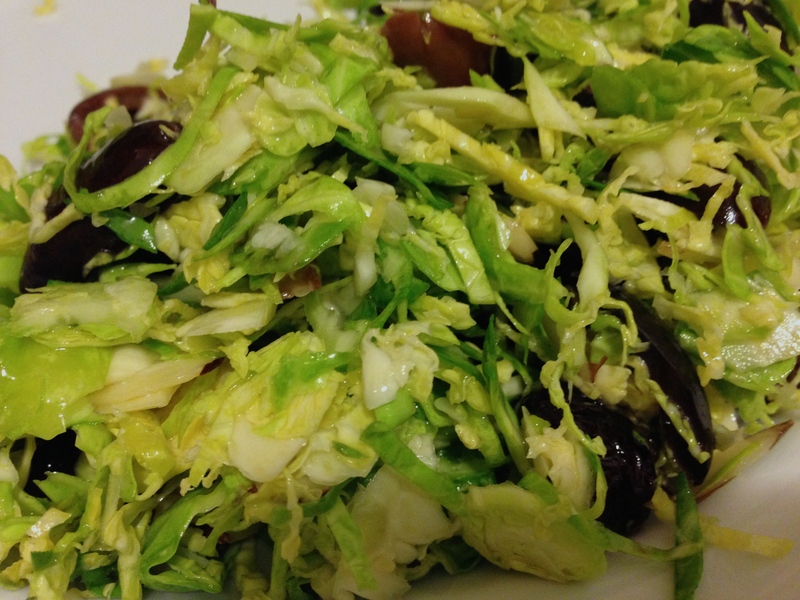 Raw Brussels sprouts spiked with lemon juice and kalamata olives. I knew I needed to replicate this dish. Thanksgiving was a little different this year. Usually my husband and I celebrate with both families on the same day. Early supper at 2pm with my family followed a later dinner at 6pm with his family, both with tables topping a dozen guests. Don’t even talk to me about food comas. But this year we did mini celebrates, one per day. On actual Thanksgiving we celebrated at my grandma’s with my immediate family dining on a traditional turkey with (much appreciated) gluten-free everything on the side. Dinner number one was delicious, but it was Friday’s dinner at my in-laws house that blew my mind. And it had nothing to do with the fancy cherry-stuffed turkey roulade. This has been an unusually mild summer. I’ve hardly had the air conditioning on all summer except for a few nights. There’s been a calm breeze and sometimes even a bit chilly at night. Still, with longer days, slaving away at a stove to make dinner isn’t exactly ideal. Sometimes raw is the way to go. 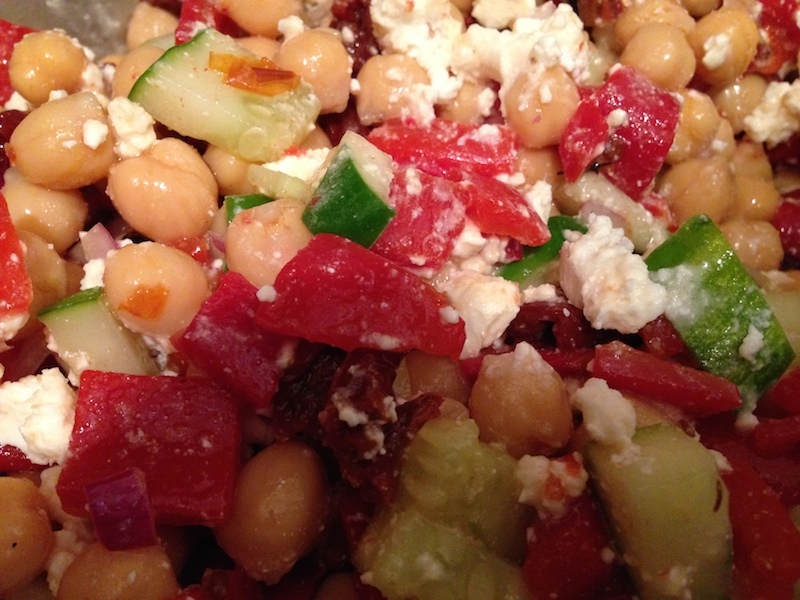 I’m not talking crazy fancy, restaurant raw food but a simple chopped salad. One of the best things about fresh produce is it needs very little seasoning to make it spectacular. For me Spring isn’t just about the warm temperatures, sunny skies and longer days (though that certainly helps! ), it’s about the produce. My regular routine begins to kick in again with early Saturday mornings at the Grand Army Plaza Greenmarket, a stop by the Park Slope Food Coop and home to unpack all my current finds followed by canning, brunching or whatever else ensues. It’s almost impossible not to come home, arms sore from carrying bags brimming with fresh picked treats. Baby lettuces, crisp stalks of asparagus, sweet, ripe strawberries–no matter how many bags I bring with me, I never seem to have enough room to carry it all. 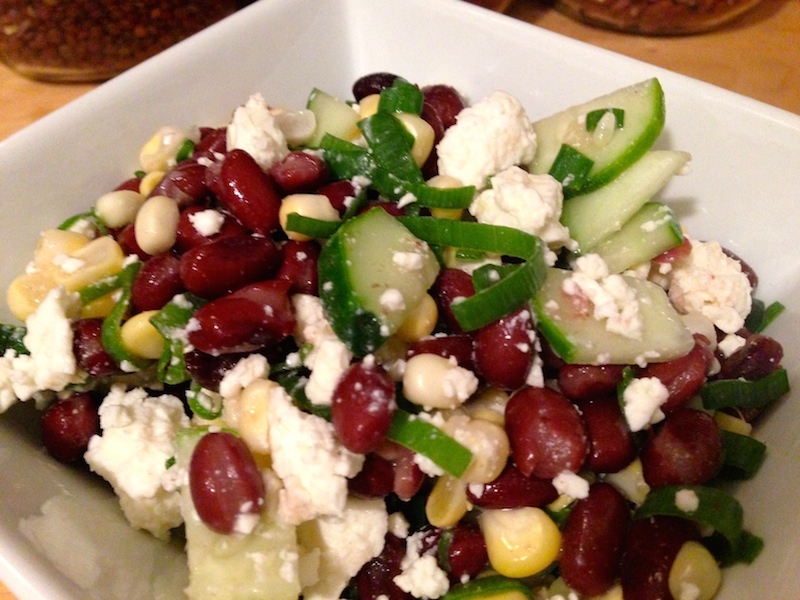 This month the Secret Recipe Club introduced me to Shockingly Delicious by Dorothy. 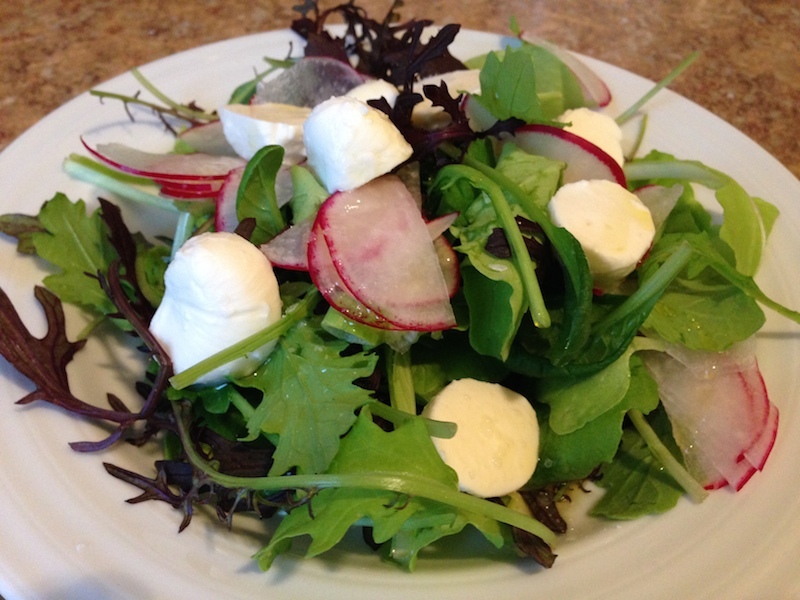 Her recipes are inviting and uncomplicated and look delicious. With the weather warming up, I was looking for something light to bring to work. Sandwiches are a bit of a bore, never mind the fact that they never taste as good when packed as freshly made. And I’ve found myself making smaller, non-leftover appropriate dinners (read: individual steaks, fish) so lunch has become a lot of takeout. The thing about working in midtown is that there are few decent choices outside of chain fast food joints, and even fewer where you can get lunch that will satisfy you for hours for less than $12. A quickly, easily transportable brown bag option was in desperate need.